Start tracking your headaches today! Do you have recurring headaches? Have you tried numerous treatments to relieve your pain? Wouldn’t it help you to keep track of your headaches, disability, pain, medications taken & other notes as you have your headaches? 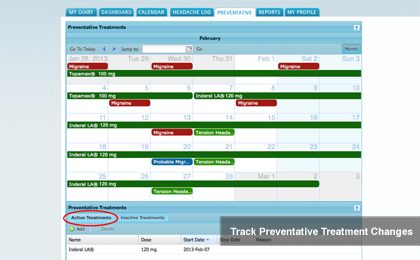 iHeadache tracks both acute and preventative treatments, disability, pain and more! Detailed graphs and charts about all aspects of your headaches including headache type & triggers. 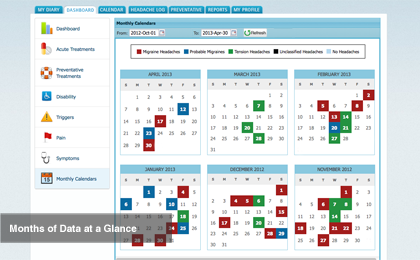 Detailed reports make it easier for you and your doctor to optimize your treatment plan. 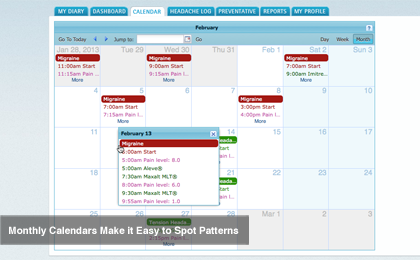 Use the calendar view to see how your headaches impact your life on a day-by-day basis. The screen shots below don't even begin to show the power of iHeadache. Click here to take the full tour! 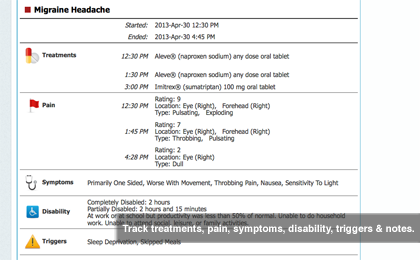 iHeadache is a free comprehensive electronic headache diary. It was originally developed for the iPhone and BlackBerry and now it is also available online. You input info about your headaches then iHeadache tracks how many headaches you are having, your disability, medication usage, triggers, pain and much more. 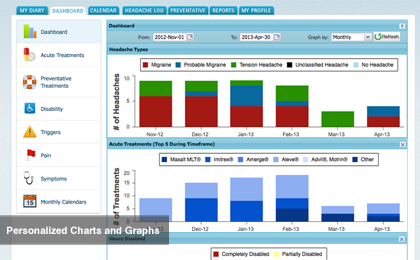 You & your doctor can use our reports, graphs and charts to optimize your treatment plan. Having better data about your headaches makes it much easier to see what is working and what is not. Start using iHeadache now and get your headaches under control!